Paul Jacoulet’s family moved from their native France to Japan when Paul was around four years old and he was brought up in Tokyo. Jacoulet showed exceptional artistic talent even as an adolescent: he developed good skills for drawing, music and languages. At the age of eleven he began painting. After befriending a young boy from the island of Truk in 1929, Paul Jacoulet spent the next eight winters in the South Pacific. He took many of the subjects for his works from the South Sea, but also from travels to Korea or Manchuria and from Japan of course. Around 1931, Jacoulet began to work with Shizuya Fujikake learning the craft of woodblock printmaking. 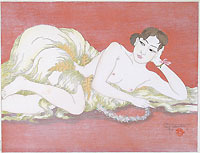 In 1934, Jacoulet produced his first woodblock print. The technical requirements on craftsmanship for a print were so high that he could cooperate only with the very best engravers and printers. Jacoulet used all the known deluxe features like embossing, lacquers, micas or metal pigments and he experimented with new techniques like powdered semi-precious stones. For most of his life Paul Jacoulet was his own publisher, selling his prints not through shops, but by subscription, in limited edition. Paul Jacoulet continued to sell prints during the early war years, though his foreign clientèle were melting away. The war drove him from Tokyo to the mountain resort of Karuizawa where he lived for the rest of his life. He continued to produce prints up until the time of his death. See Richard Miles, The Prints of Paul Jacoulet: A Complete Illustrated Catalog, London, 1982.